Doctor Who "Nightmare in Silver" recap: Neil Gaiman writes a disappointing episode. Doctor Who “Nightmare in Silver” recap: Neil Gaiman writes a disappointing episode. We needed a classic episode this season. Neil Gaiman or no Neil Gaiman, this wasn’t it. In Slate’s Doctor Who TV Club, Mac Rogers discusses the Doctor’s travels via IM every week with the show’s bloggers and fans. This week he’s chatting about “Nightmare in Silver” with Frank Collins, who edits Cathode Ray Tube. Mac Rogers: This week the Doctor brings Clara and the two kids she’s looking after—Angie and Artie—to a planetwide amusement park in the far future called Hedgewick’s World. This proves to be a poorly selected field trip location when they discover that Hedgewick’s is 1) closed and 2) sitting atop a storehouse of upgraded Cybermen who are about to wake up. Like the last episode you and I discussed, “Nightmare in Silver” introduces a number of new wrinkles to a classic series villain. Frank Collins: The Cybermen have a long history of changing their appearance, and I was pleased to see the rather clunky looking Cybus-era versions replaced with something much more akin to the 1960s Cybermen seen in “The Moonbase” and “Tomb of the Cybermen.” The faces are much better, and those embarrassing flares have gone. I quite liked the superfast reactions, like they were all The Flash, as that really gave them a sense of power, and I certainly enjoyed the Cybermites as an upgrade on the Cybermats. Mac: Yes! I was amused to see that one Cyberman using the signature True Blood-style rapid-vampire movement to get its hands on Angie. The Cybermites seem to be part of a running theme this season: making lumbering classic series monsters more nimble. Frank: Makes sense, given Moffat’s remit to Neil Gaiman to make the Cybermen scary again. Gaiman has publicly declared his affection for “The Moonbase” as his first sighting of the Cybermen and their inherent uncanniness, which he’s attempted to recapture here. On the other hand I believe Moffat is very wary about using classic monsters, partly because they don’t stand up to the more sophisticated tastes of a younger audience who have been dining out on contemporary depictions of monsters and aliens. So there’s a tension established whenever a classic-era monster returns to the series. Mac: That’s a good point. Some of these upgrades can come across like the monster equivalent of the middle-aged man buying a sports car to seem hip. Frank: The age of the viewer is a determining factor there, too. It’s entirely possible there are viewers young enough to have never even seen the Cybus-era Cybermen, never mind their 1960s cousins, and for whom all of this is entirely new. Mac: Between this episode and “The Doctor’s Wife,” it’s pretty clear that Neil Gaiman likes having the Doctor meet other colorful eccentrics. In “Nightmare,” these include the shabby master of ceremonies Webley – who will accept payment in sandwiches – and his assistant Porridge, played by guest star Warwick Davis. Even the soldiers here are kind of the misfit toys of the military, a “punishment brigade” sent to languish on Hedgewicks on the assumption that they can’t do any damage there. Do you see an emerging Gaiman vision of Doctor Who? Frank: Gaiman’s work has a lot of mythological and fairy tale elements in it, and with “Nightmare in Silver” he’s tapping into a number of ideas about the eighteenth and nineteenth centuries’ fascination with automata. He clearly references The Turk, a chess playing automata presented by Baron Wolfgang von Kempelen in the eighteenth century, which was revealed to be a trick, concealing the human chess master operating it from within. This taps into our desire to be deceived by machines, the uncanny valley where we fear something so approximate to the human form. I’m sure Gaiman’s biggest influence, not just on this episode but also on his Sandman books, is the work of E.T.A. Hoffman and his tales “Automata” and “The Sandman.” In the latter the central nightmarish figure carries off children into the night to feed to his own offspring. That Angie and Artie are carried off by Cybermen because their child brains are ripe for the creation of the Cyberplanner is a reflection of that idea. Gaiman sits very comfortably within Moffat’s fairy tale-based vision of Doctor Who. Mac: The fact that the kids were coming along this time out was a little worrying to me, but I have to admit Gaiman wrote them well. Angie’s adolescent brattiness was funny (telling the Cyberman “Put me down! I hate you!”) but limited enough so it didn’t get too annoying. 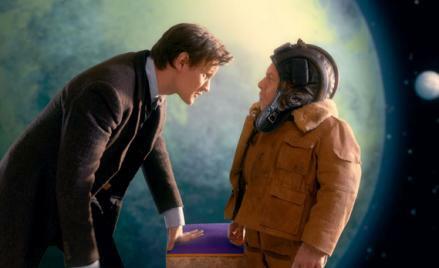 But it also illustrated why the Doctor shouldn’t travel with children regularly: It makes him look a lot more irresponsible when they’re in danger! Frank: Having young companions on board is rather like taking us back to the innocence of Jamie and Victoria in a way: child-like figures constantly in peril and very unlike the resourceful, full of attitude versions in the new series. Mac: The speed with which Angie, Artie, and Webley were cyber-converted was the scariest part for me. I love the idea that the Cybermen can now convert people so quickly that the only way to stop them was to blow up any planet they turn up on. It’s a brilliant concept—that the very nature of the Cybermen forces their enemies to become equal monsters to stop them—but by setting “Nightmare” on a largely abandoned planet, Gaiman side-stepped the moral dilemma: do we kill innocents to save a much larger number of innocents? Also the Doctor vs. Cyber Planner chess game ate up most of the time available to explore this. Frank: The tussle between the Doctor and the Cyber Planner reminded me of Kasparov playing chess against IBM’s Deep Blue (plus the notion of the Cyber Planner beating the Doctor and passing Turing’s test for artificial intelligence). Mac: I thought it was a mistake that the Cyber War was a thousand years in the past. It would have been more interesting for it to have occurred in living memory. In particular, Porridge’s self-imposed exile from his imperial responsibilities - and his willingness to hold back the simple action that could have saved everyone at any point in the episode - would carry more weight if he himself, rather than an ancestor, had been the one to order the destruction of millions of planets and billions of people in the war. Frank: And he would have been more a mirror of the Doctor, still feeling the ramifications of the Time War, and perhaps this is something Gaiman was trying to articulate. How Porridge’s responsibility is such a burden and his reluctance to wield great power could have made it a more emotionally powerful episode, but the drawn-out chess game rather sidelined all of that. Mac: Did you figure out that Porridge was the Emperor? Frank: I didn’t, so it came as a nice surprise. Mac: Gaiman did a nice job of hiding that in plain sight. And actually, he does a better job than most of the current writers at showing the Doctor getting out of jams with his cleverness, rather than love- or temporal-trickery-based resolutions. The way he saved Clara and the others from the Cyber army by playing on the Cyber Planner’s ego was fun. I’m possibly being more critical than is warranted because I and probably many other fans wanted another episode as great as “The Doctor’s Wife.” Which is a bit unfair. Does “Nightmare” have a chance of pleasing with that standard? Frank: No. It doesn’t reach the emotional intensity of “The Doctor’s Wife,” probably because of the multiple characters and the bucketloads of ideas Gaiman has stuffed into it. It’s an interesting episode, but the underdeveloped characters sap the viewer’s identification with them and the Doctor/Cyber Planner face-off doesn’t work. It takes up too much of the episode, becomes slightly annoying, and Smith’s double performance isn’t nuanced enough to keep it on track. Mac: It’s tough because I feel like Season 7 is shaping up to be the first since the series revived to not have a clear “classic” episode, and I know I placed a lot of hopes on Gaiman to plug that hole. Frank: We haven’t had the equivalent of “The Girl Who Waited” or “The Doctor’s Wife” this year. I think some issues lie in Moffat’s sidelining of a cohesive arc holding together Series 7. Instead, he replaced that with standalone ‘movie event’ style episodes, split the season (losing its momentum in the process) and created a mystery in the character of Clara herself. Mac: Jenna-Louise Coleman remains utterly charming and charismatic as Clara, but “Nightmare in Silver” illustrates that there’s still no consensus on how to write her. The frightened Clara of “Cold War” and “Hide” now slips into commanding platoons of future-soldiers without a second thought. Frank: She claims she’s following the Doctor’s orders here, and perhaps there’s also a maternal instinct kicking in, a need to fiercely protect Artie and Angie. There is some inconsistency in how she’s written, but she is generating some mad theories: she’s a future Doctor, she’s another Time Lord, she’s River, she’s Romana, she’s Susan or she’s Jenny. It’s all got something to do with the Doctor erasing himself from history, and as the Cyber Planner intriguingly points to the Doctor, “You know you could be reconstructed by the hole you’ve left behind.” Perhaps Clara is the Doctor’s absence? Mac: Our last shot at a “classic” this year is next week’s intriguingly-titled season finale “The Name of the Doctor,” but I’m worried that it will be too loaded down with loose ends to tie up and a 50th Anniversary special to set up to shine on its own. But I’d love to be wrong about that! Frank: “The Name of the Doctor” is, I suspect, going to be crammed with lots of fan-pleasing moments and will attempt to tie up a number of hanging narratives from the past, so if we get a coherent story out of that I will be impressed. And I’ll be seriously surprised if we get to know the name of the Doctor.